These mirrors are aluminized on the surface nearest the incident light. Energy loss is minimized because light does not pass through the glass substrate. Available in circles, squares and rectangles. Custom sizes are available for volume OEM requirement. Our Reflectors and front surface mirrors are coated with aluminium, silver, chromium and gold with suitable protective coating. YAG output coupler and YAG rear mirror. We are providing the Hr Front Surface Mirror product to our customers. We Leading supplier of Front & Back Mirror-VLOC in Hongkong. 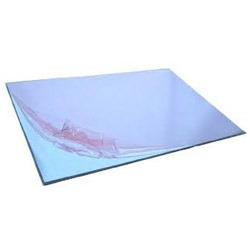 Front End Coated Mirror having Optical flat surface with Aluminium coating on the first surface with the protective layer of Silicon Monoxide or Dioxide. Beam combiners are partial reflectors that combine two or more wavelengths of light -- one in transmission and one in reflection -- onto a single beam path. Commonly ZnSe, ZnS, or Ge, beam combiners are optimally coated to transmit infrared light and reflect visible light, as in combining infrared CO2 high-power laser beams and HeNe visible diode laser alignment beams.